NANTAHALA The Nantahala River flows through the scenic Nantahala River Gorge in Swain and Macon Counties in the Nantahala National Forest of Western North Carolina. The 8 ½ mile stretch of the river from the Beechertown Power Plant to Fontana Lake is home to the most popular whitewater rafting, canoeing and kayaking in the Southeast. In addition to the whitewater sports, the Nantahala River Gorge provides for a variety of additional recreational activities including fishing, hiking, gemstone mining, picnicing, photography, plant and wildlife viewing, bird watching and viewing the popular whitewater sports. The Cherokee called the Nantahala the "Land of the Noonday Sun" because the walls on either side of the River towered so tall that the direct light of the sun could only shine into the Gorge during the middle part of the day when it reached its highest point in the sky. James Mooney, an early ethnologist who lived among the Cherokee at the turn of the century, recorded in his "Myths of the Cherokee" that the name Nantahala is a mispronunciation of the Cherokee word "Nun-daye-li" meaning "middle sun". The Nantahala Gorge was an established trail of the earliest Cherokee when they traveled back & forth between their villages from the Valley areas of Andrews to the Middle Towns along the Tuckaseegee and Little Tennessee Rivers. The Cherokee considered the Nantahala Gorge a spiritual place. Their legends told of of Uktena, the giant horned serpent, and the mischievous "little people" who lived in the Gorge. In the late 1700's white settlers moved into the area and established homesteads and small communities. In the 1940's a number of dams were built in the area forming man-made lakes including the Nantahala. A massive concrete power station was built to provide hydroelectric power to the mountain area. Giant pipes carry water from Nantahala Lake across the mountains to the Beechertown power plant where it is dropped down on giant turbines to produce hydroelectric power. After going through the turbines the water is sent rushing out of the powerhouse and down the famous 8 ½ mile stretch of the Nantahala River between the power plant and Fontana Lake creating one of the most popular whitewater rafting attractions in the United States! People from all over the world come to participate in the fun and exciting whitewater sports on the Nantahala. In addition to generating hydroelectricity the power plant provides a good dependable water supply for whitewater rafting all year long. Today the term "Nantahala" is synonomous with whitewater adventure. People can be seen wearing "I Survived the Nantahala" or "Paddle or Die" T-Shirts and shopping in the gift shops, dining in the restaurants and participating in all the activities provided in this outdoor adventure capital that is still known today as the "Land of the Noonday Sun". The Nantahala River Gorge is a beautiful natural environment and it is host to a wide variety of plant and animal life. Its rugged terrain offers a diversity of habitat ranging from the lower river gorge to the high majestic peaks. Both deciduous and evergreen trees make up the impressive Nantahala National Forest. A wide variety of lichens, ferns, mosses and herbaceous plants can be seen in the higher elevations. In the lower gorge a diverse plant population provides lush ground cover and it is a wildflower lovers paradise with many varieties of flowering plants that can be seen in the spring, summer and fall. A variety of animals including bear, deer, raccoon, opposum, fox, squirrels & rabbits make the forest their home and a great variety of birds live in the canopy adding their calls and songs to the sounds of the forest. U.S. Highway 19/74 travels along the south side of the river and provides access to the Nantahala Gorge. Travelers are treated to the sights of happy paddlers rafting down the Nantahala River. The Great Smoky Mountains Scenic Railroad runs along the north side of the river treating the train riders to the whitewater show from the train. Access to the backcountry of the Nantahala River Gorge is provided by a number of hiking, biking and horseback riding trails. Plan to take some extra time to enjoy this scenic natural wonderland in this friendly mountain community that has become a popular destination for whitewater fans and outdoor enthusiasts from all over the world. 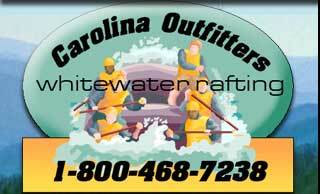 Carolina Outfitters is a fully licensed and U.S. Forest Service approved company. We are an equal opportunity outdoor recreation provider.